The 8¢ Trans-Mississippi is one of the most difficult denominations of the set to obtain in such superb condition. 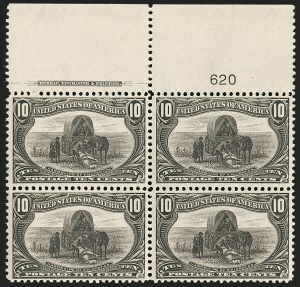 We have offered only one Mint N.H. top plate number block of six since keeping computerized records. 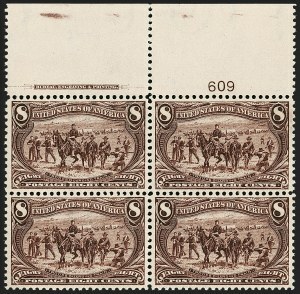 Of the plate blocks of four we have offered, several have issues such as gum wrinkles, or have poor centering. This example is the finest we have ever offered. The great name auctions containing plate blocks, such as Colonel Green, Eno, Sinkler, Todd, the Weill Stock, Kobacker, Wampler and Fogelson, either had a plate block of four of the 10¢ Trans-Mississippi or none at all. 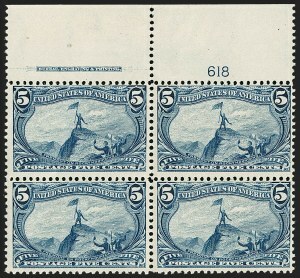 We have sold only five other Mint N.H. top imprint and plate number blocks of four since keeping computerized records. 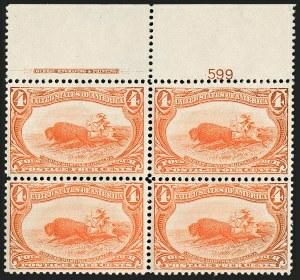 We found only three that compare favorably to the superb plate block of four offered here. 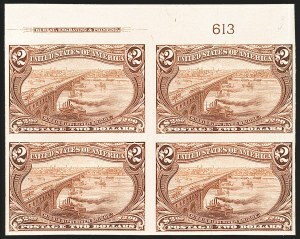 The 2¢ Trans-Mississippi plate proof is equally rare--we have found six singles and no multiples. At one point the vignettes for the 2¢ and $2.00 were switched, so perhaps this is the reason why plate proofs of these two denominations were released.